Time appears to have stood still for Viking Bay .The half-moon shaped sandy bay remains the same today as it has always been. 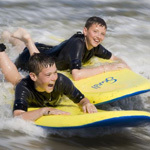 It is still the premier beach and resort in the area however it does have some stiff opposition. 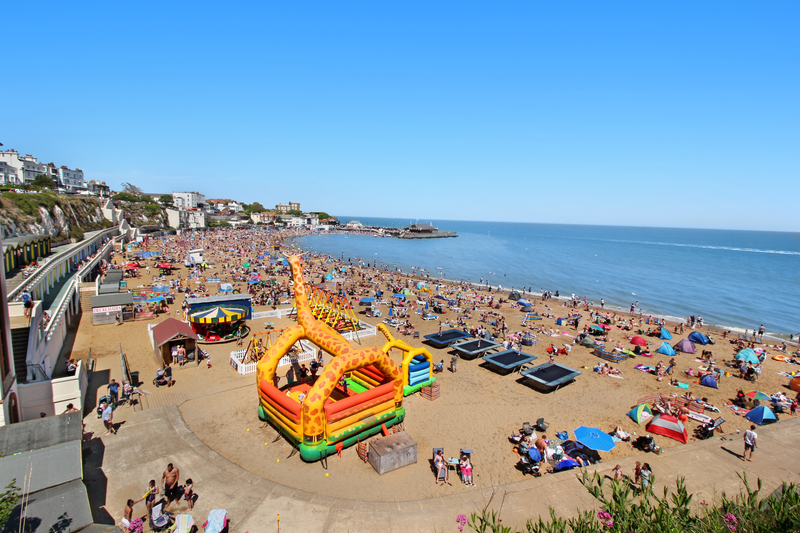 Viking Bay is a typical Victorian beachside destination and it still has its brightly coloured beach huts, pier, and wonderful promenade sitting nonchalantly at the top of the resorts white cliffs. Looking down onto the harbour is Bleak House, which Charles Dickens used to frequent, he actually wrote his novel David Copperfield there. There are steps taking you down to the clean sandy beach or if you have mobility issues, there is a lift to take you down and bring you back up to the promenade. Ramsgate is still a working harbour and not at all pretentious. It is in fact a Royal Harbour, the only one in the UK to be given the title. Sat besides the harbour is the marina with leisure craft of all shapes and sizes from various parts of the world. The harbour has an historic past being so important to the country during events such as the Napoleonic wars as well as being central to the mass evacuation of our troops in 1940 from Dunkirk codenamed Dynamo. The boats of Ramsgate harbour set sail that day on a mission to save nearly 310 thousand British troops whilst being bombarded by the Germans. One of the boats (Sundowner) used that day is still on display in the marina. Ramsgate repatriated 40,000 troops alone who were clothed and fed and looked after by local people. Ramsgate has a magnificent history dating back to Anglo-Saxon times and still has a part to play in Britain’s future. Ramsgate has a rich Regency and Victorian theme, which can be seen through its architecture. In Ramsgate, there are 900 listed buildings 200 of which are near the harbour. You can take in the view of the architecture whilst sitting in one of the many cafes, which surround the harbour. Fine restaurants are scattered throughout Ramsgate, as are wonderful Fish and Chip outlets. Ramsgate has a very cosmopolitan feel about and is well worth a visit. A perfect choice for the old-fashioned, traditional family holiday. Margate has a strong tradition with the sea being part of the Confederation of the Cinque Ports. However, for the past 250 years it has become the holiday destination for Londoners who enjoy the traditional seaside resorts. Londoners who want to get away from the fumes and hustle of the City come to Margate, spread their wings and fill their lungs with clean fresh air and relax for a few days. The beach is a 200-yard crescent of clean unblemished sand with seawater so clean it has been given many awards. There are many things to do in Margate such as the first ever UK pleasure park known as Dreamland. It boasts rides old and new with their historic 1920 roller coaster now back to its glorious best. The wooden grade II listed ride was unfortunately damaged in a fire in a 2008 arson attack but she has risen from the ashes to thrill the young and old again. Dreamland was immortalised in the “Only Fools and Horses” episode “Jolly Boys Outing”. If you prefer a more physical pastime why not cycle or walk to either Ramsgate or Broadstairs along the clifftop paths .If its culture you like, try the Turner Contemporary art gallery and cafe .There are many varied food outlets in Margate selling cuisine from various countries. The quiet neighbour of its illustrious bigger relation Broadstairs, the name Botany Bay came from the fact its local smugglers were caught with their ill-gotten gains and were then deported from there to Botany Bay in Australia. Admittedly, you will not find the excitement of smuggling at Botany Bay these days but there is still plenty of things to do that will pass the time of day. 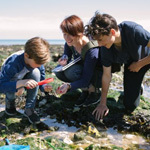 Botany Bay is the quietest of all the bays, ideal for letting the children run wild while enjoying themselves in the nooks and crannies of the brilliant white chalk cliffs that form the beach backdrop. When the tide has gone out there are plenty of opportunities to put your Jurassic hat on and hunt for the many fossil formations hidden in the chalky deposits. The rock pools are an exciting place to try to discover the different sea life, which hides away in them, pretty much unnoticed most of the time. When you feel the need to relax and take it easy, why not find a little secret hideaway and have a family picnic or beach barbecue. There are cafes and public houses nearby as well as hotels.